Life never seems to happen at a steady pace, it surges and wanes into tides. Its not that there isn’t progress in a wane period, its just that we mark the starts and ends of things. Which means that I have plenty of WIP to post, just not much for the done pile. I actually did finish two projects, but one is a gift and the other is… well its brown. Now keep in mind I LIKE the chocolate brown and it is 100% Alpaca so its soft and warm. This yarn was languishing in my stash for the past two years from a yarn swap and ever subsequent yarn swap I have this extreme onset of guilty feelings about not having used yarns from previous swaps or gifts. But I’m not sold on its final form and perhaps I’ll just have to frog it and start over again. I was determined to finish those blocks by my anniversary, so I set our a few days to finish off the last few. They need trimmed up and I am considering adding some inner vining borders, but overall here’s where we are. 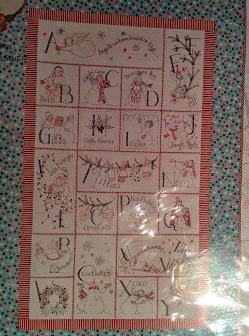 New goal is to have the top and backing done and ready for quilting by Christmas. I am technically still on schedule for my cross stitch project since I am working on the 3rd quarter in the 3rd quarter, but it feels like I’m a bit behind. My hobbit scarf is actually behind by about 60 rows. We are currently riding in barrels on the way to Lake Town, but if I can get to the Last Light of Durin’s day by the last light of August 31 then I’ll be caught up again. Meanwhile in the “it seemed like a good idea at the time” and “good lord what can I do for the Ravellnic games” depts… A fellow knitter started a color work socks informal KAL. And I started two different socks and then they got set aside to join that one sock on the last round I was in of Sock Madness 9 in May of 2015. So that’s my challenge… to finish up all of my partial color work socks. You might recognize that blue yarn in the last sock… its from my most recent completed yarn swap. I am midway in another swap. My recipient has already received what I sent and took great photos. And I really can’t wait to see what shows up at my door. Until then… back to socks and scarves and stitchery things. Let me be up front, if you came for some finish photos, well… there won’t be any here today. In fact when I first thought about making this post I wasn’t even sure there would be knitting or quilting in it. Confession time; we are now midway into the second week of the year and I have not knit or quilted a thing! Last Wednesday I had nothing to post in the WIP weekly thread for knitting and it surprised even me. Taking just a moment now and then to track how your projects is good for the soul. Unfortunately, we sometimes want to scrub our beginning efforts from the record. I was reminded of this when I went through my stash for yarns I want to use up or donate this year (I’m calling it my Knit It or Quit It stash) found the yarn from my first scarf, which I at one point had frogged. Its a bit of a shame really… and now I am going to find something new to make with it. Tracking progress both on an individual project and on abilities over time doesn’t need to be complex. A large percentage of the population actually have cameras in their phones at their fingertips. When you finish for the day, or get to a spot you want to track, just snap a quick photo. Maybe you turned a heel (always feels so satisfying) or got to a point where you could finally see the pattern or texture (and maybe you frog it or keep going) or you are trying out a layout… it doesn’t matter the reason. Taking a few minutes to make a note or snap a photo is worth it. When you look back across the span of your skill journey you see how your latest socks with its cables/beads/no pattern design compares to that first pair of plain stockinette with a heel turn you just had to believe in the pattern because your brain didn’t yet wrap around the concept yet all fit together. For my knitting, I upload these to Ravelry. (Pro Tip, if you tag your projects with the year you have a nice view with yardage of what you have done for the year too!) For my quilting, I file them all in a folder/album on Google, since my phone is already set to auto-update to there. Once a week or so I just go in and move the relevant photos to their albums. You don’t need to master photography and only take beauty shots either. Its ok to show the wrong side of your work. In fact, there are times when as a crafter that’s exactly what other people want to see. Sometimes its to see how that pattern fits a body shape, or how a color variation (variegated/stripes) may look. Maybe you knit it up and can then show visually what you are having trouble with and ask for help. And.. because we all know I wasn’t not crafting… here’s my latest WIP. My in-laws bought me a cross stitch kit off of my wishlist for Christmas. Based on my math its final design is in the neighborhood of 50k stitches. I have already made a few mistakes, corrected a few, and am probably doing it all wrong according to at least one person. But isn’t it fun to watch it grow? Weddings sure do eat up a bunch of time out of a month! So alas this time I am a bit light on the finished items, and have lots of Works in Progress to share (WIPs). First up… I am continuing my stash busting, and tackling some yarn I thrifted a few years ago. These big hanks take up most of one of the closet stash boxes. They are slowly becoming a sweater with some modifications to give it a collar and pockets. I am up to the right front, pockets and the collar to complete. both of these are finished and blocking now. Well this is rather complex, and a bit bulky, so less transportable… so I started some other project too. It may be getting out of hand. There is a baby blanket from some stash acrylic in a modified tree tops style. I’m a bit of a ways from being done with those last few projects. Hopefully they will show up in a blog post her soon…..ish. I got myself out to the Western Washington Quilt Shop Hop the past few days. Its actually my first year participating, although I became aware of it a couple years ago when the now defunct local shop was participating (which sadly I was not in town for that time). I’d posted a reminder on Reddit for the other locals of the group and Jean asked me if I was taking the bus…. which was the first I’d heard of it, and with some encouragement, I decided to go for it.. and I am ever so glad I did. There were just shy of 30 of us on the bus for the North bound trip, and we visited 12 shops that day. 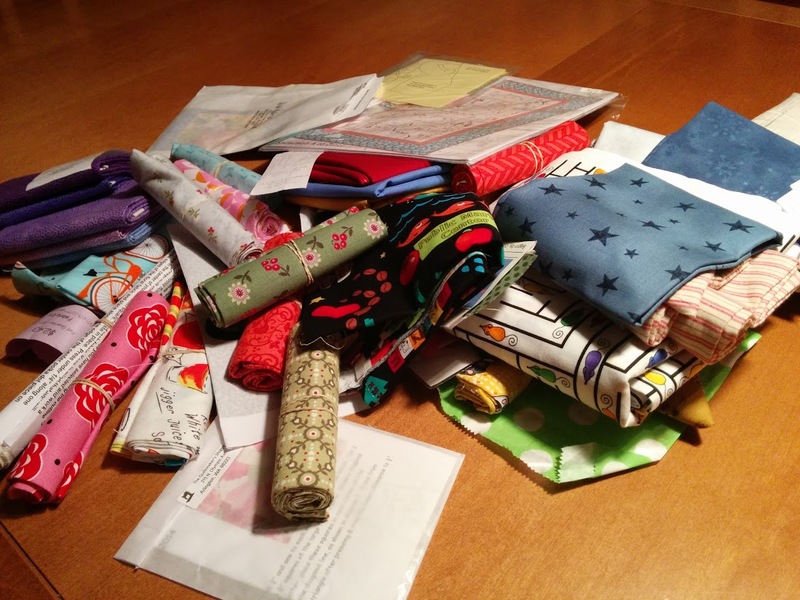 It was organized by the ladies at Gathering Fabric in Woodinville, who not only planned the route, but handled the majority of the passport stamping and picking up your free quilt block pieces, so all you had to do was enjoy the ride, discover new quilt shops and shop. And did we ever shop…. Its a Busload of fabric! I actually didn’t go too much overboard, and most of my fabrics were for specific quilts I have in mind. But there was also some things I just couldn’t leave at the store. Seattle Fabric. There are two colorways of this. I snagged a yard of each. Rats in a Maze! Later I found small red mice buttons I may use with this one! Adorable fish, the back to another project and the other Seattle fabric color way. I did find a new gift/project, and while normally I don’t post such things to my blog pre-gifted… since this one involves so much work I think I can get away with it and it will still turn out to be a surprise when its done. So much embroidery….. so very very much. I also picked up some beads and buttons for my knitting, and stopped at 6 shops on Thursday and Friday… and all before I had to pick up Ben at the airport. It was a great time, and I met some amazing people and I’d do it all again in a heartbeat! There are no Resolutions in this post, only ideas. I don’t really make New Years Resolutions… more because people seem to think its a great thing to think of and then don’t take them all that seriously. So I always have ideas and things I want to do and I do list them out as goals. In 2012 it was a new Christmas Stocking each month from January to October with a goal on selling them. I exceeded that plan in the crafting department, but I wish I’d done a bit better in the selling. In 2013 it was sweaters, gloves, and working on my Star Quilt. Well I did get the Sweaters part done… I made 3 this year. I didn’t get any gloves made and the only mittens were for a 6 month old which didn’t really have separate thumb holes so I am not counting them towards the original goal, and not much work on my star quilt so those will just have to move into 2014. Instead I tackled some lace shawls. I also made up some great plushies, custom curtains and finished my first ever double knit scarf… so there was certainly quite a bit going on in 2013. So now its time to think about all I want to achieve in 2014…. I have six quilts on my list this year! An as yet to be determined 2nd quilt for the family room. Ben loves our VideoGame quilt, but thinks there should be a second quilt, because after all there are two of us. In the knitting front I’ve got some other unique projects planned. A Scarf and Shawl from my wonderful new Alpaca yarn! I’m debating making my own patterns for these, but we shall see! Gloves are still on the list! I’ve already got the conductive thread to make them Smart Phone capable! 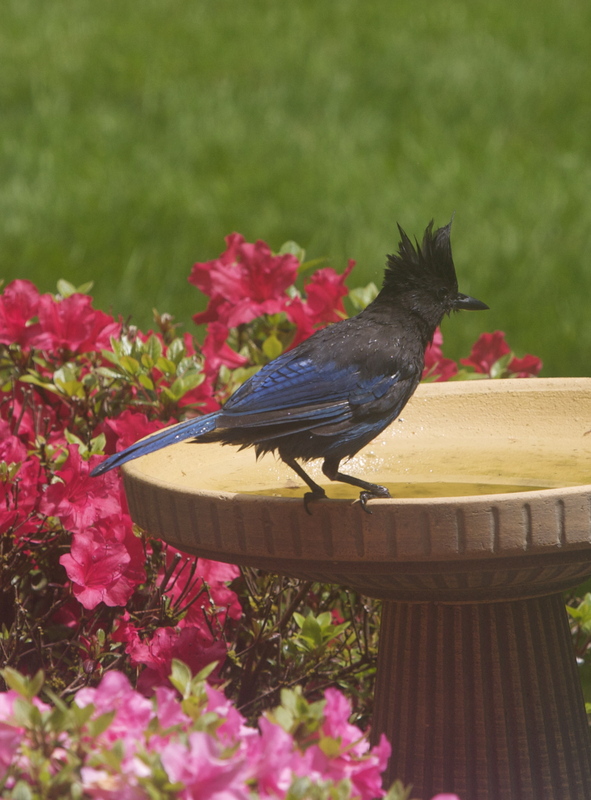 These Jays from the PNW are vibrant Blue and Black! 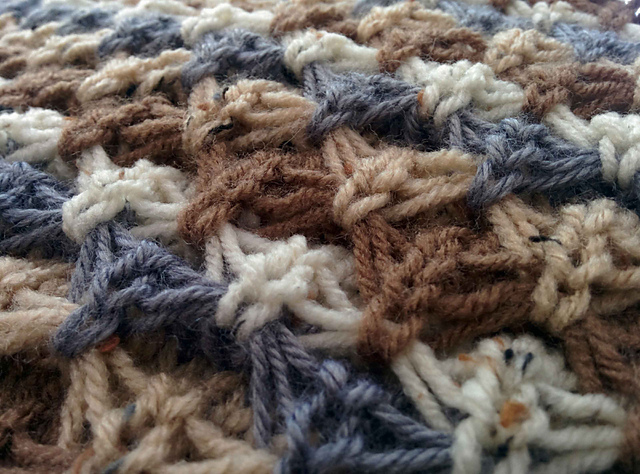 I’d also like to tackle Brioche stitch as a new stitch this year. Perhaps I’ll use up my “Action Green” from the Seahawks Stocking on that. So its a bit of a list looking at it all at once… but if I can tackle 3 sweaters, 4 quilts and learning so much about lace in a year… I out to have a good start on some of these… RIGHT?